If you enjoy spending time with your family and friends outdoors at your home in Bluffton, South Carolina, but you’re sick of dealing with intense sun, pesky insects, and other annoyances, then a patio enclosure might be the perfect solution. At Porch Outfitters, we are outdoor living specialists who have been custom building patio enclosures since 1987. We’ll create the perfect space for your needs and build it with the finest materials and with the utmost attention to detail. When you partner with Porch Outfitters, you won’t have to worry about getting a cookie-cutter enclosure that looks tacked on to your home. We tailor our projects to our customers’ homes and preferences and offer a variety of outstanding options. For example, we can install beautiful and highly functional sunrooms from the industry leader TEMO that are available in several styles. We also build custom screen enclosures using high-performance materials that will last for years without signs of wear. And, we can build these enclosures to look like a natural extension of your home, complete with matching roofing and siding materials. At Porch Outfitters, we’re proud to have only our own trained employees – not subcontractors – complete our projects, as this ensures our strict quality standards are adhered to throughout each step of the installation. And, upon completion of your project, we’ll provide you with a lifetime workmanship warranty for your peace of mind. 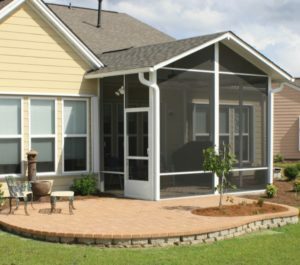 Learn more about the patio enclosures that Porch Outfitters installs on homes in Bluffton, SC, by contacting us today. When you do, also ask about the convenient financing options that we offer to qualified homeowners.